We know how daunting it can be planning a group trip for your class of students. Take the hassle out of planning your trip and let Celtic Group Hostels in Ireland do all the hard work and plan it for you. We have 25 years' experience in planning and organising hundreds of group trips to Ireland every year. In Dublin we have a central reservations office dedicated to group bookings, staffed with a small experienced team. Everything we do, every day, is designed to make it as easy as possible for teachers and group organisers to make bookings in our hostels. You won’t believe how helpful we can be looking after all aspects of your booking with constant support and back-up during the process. To make your groups stay the most enjoyable experience possible we have put together a range of activities and tours which can be booked for them via our central reservations office. 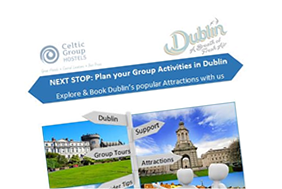 These services range from the most popular attractions through to Irish Experiences and beyond sightseeing special interest visits - all at discounted group prices ! Each year over 800 groups enjoy our hostels in Dublin, Cork, Galway City, The Cliffs of Moher and Connemara. Our repeat booking levels are the highest in the market with hundreds of groups and thousands of students re booking with us every year. We are a "One stop shop" for all your group travel requirements in Ireland - check them out below or contact us to discuss your requirements. Fill out our booking form to get started now! Not ready to book, but want to ask us a question? Compile your requirements list - i.e. preferred dates/locations/numbers of leaders/students and any additional or special requirements your group has. Complete our online inquiry form with these details - Book now! Receive a detailed quotation from us - We will reply to your enquiry within 48 hours. We will send you a detailed quotation in writing - including room breakdown availability / pricing / special offers if applicable, etc. Each quotation will have its own unique reference number - please use this reference in all correspondance with us. Provisional bookings - We can make a provisional booking for your group in order to guarantee the availability. This is very important and will allow you time to source flights, etc. We will give you a deadline of how long we can hold the provisional booking for and will touch base with you at this deadline date for an update. Confirmed bookings - If you confirm a booking with us we will send you a written confirmation containing your booking reference and payment details. An invoice totalling all costs, deposit due dates, etc. will also be sent to you for your records. We require a 25% booking deposit to fully confirm a reservation. We will require full contact address details to process the invoice. Activities & tours booking service - We can book a full range of activities & tours for groups staying in our hostels - airport transfers, meals, tours, attractions, Irish experiences, etc. Just tell us what you need and we will book it for your group. To get ideas check out our activities & tours section here. Check up - We will touch base with you several weeks prior to your group's arrival to check to see if you have any other requirements and remind you of your balance due dates and other details that we will require to finalise your group. Amendments / changes - You can amend the rooming on booking as required to match your group's breakdown (subject to availability). We understand that group numbers go up/down and we will work with you to get the best rooming breakdown for your group. Booking summary & vouchers - Prior to your group's arrival we will send you a booking summary as an overview of all services booked with us for your group and vouchers for the revelant services booked (if applicable). This is important documentation and must be produced for all services booked by Celtic Group Hostels. Back up and support for your group in Ireland - We provide 24 hour back up and support for your group whilst in Ireland in case of any emergencies, etc. We have a 24 hr emergency contact mobile.